"Renoise is my main DAW, and I also use some drum machines, sequencers, and other hardware, along with my Doepfer, Arp, and other modular synthesizers." 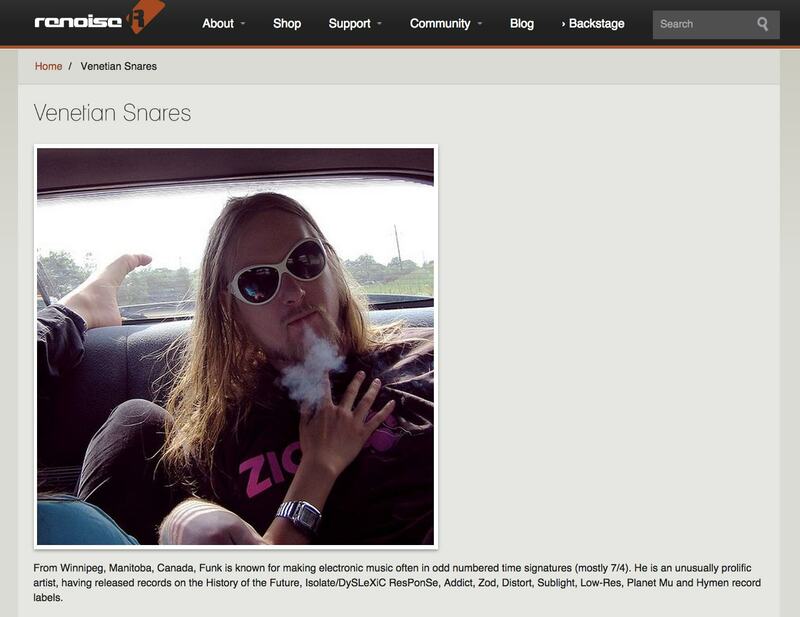 Venetian Snares is listed as a [Renoise artist](http://renoise.com/artists/venetian-snares). In an interview with [Future Music](http://www.musicradar.com/us/news/tech/in-pictures-john-tejadas-gear-stuffed-studio-616361/2), John Tejada says, "While I find DAWs interesting, I don’t find them very interesting for creating music. I loved those days of just getting lost inside the [EPS](http://equipboard.com/items/ensoniq-eps) [sampler] or an Akai MPC, so for that reason I’ve become a huge Renoise fan." No quote or explanation available. DJ Hidden is listed on the official Renoise website as a user of Renoise. On his Youtube page posted a video with his track playing from Renoise software. Though it may look like you're standing outside the Matrix, it contains so many useful and flexible tools for sampling and synthesizing. Its rock-bottom price and amazing sound profile means you should definitely check it out. To quote the vernacular, that GUI is off da hook, dawg. I love renoise it's great it is easy to use and customization you can script within it and the automation is very good. the reverb is excellent with renoise you are right into the detail it's fast and great for sample mangling. Renoise is the Gundam of tracker-style software. Only had posession of this today, and already I can say how much fun this thing is. It's so retro and yet so polished. I wonder how many well-known tracks have been made with this. Love it to bits. overall, it's you. it's not renoise. renoise is a hot friendly smart caring guy and it's you. renoise has done nothing wrong, and never will. get the right sounds -- get the right sequences -- u ho. This is a surgical tool for my needs. Very inspirational tool. As good as any other DAW out there! I first started making music in 1995 with a piece of software called *FastTracker - I was heavily, emotionally invested in something called *the demoscene, a bunch of talented and creative guys who made, basically, music videos. Music making softwares in those days did not look like anything like today's horizontal-UI-based DAWs, FastTracker looked like Excel to everyone who did not understand what they are seeing. To us who used it on a daily basis, in looked like the same, only with meaning. Renoise is a *tracker, such as FastTracker, a DAW where progression is vertical instead of horizontal and where the underlying math looks more prominent. If you can get over that (and also the thing that notation is a tad bit different and you really are working in a spreadsheet, to give you an overall view of things to come), this baby is amazing. Compact, fast, solid, works with most VSTs, does not crash often (I had my weird problems with my EMU0202 sound card, though, when you try to quit Renoise, you often have to resort to a force quit) and I made a full EP on it. My problem with it, though, is that in the long run I needed to work with vocal tracks and that is something that I simply could not solve neatly (maybe because I completely overlooked a feature?) and also in terms of visuals I liked an approach better which gives me visual oversight on the whole length of the track down to the sample level without clicking too much. TLDR Renoise is as good as any other DAW out there. Main point of difference for me was the underlying logic and the lack of the horizontal track view. If you can live with it, this will be an amazing flagship in your arsenal. Renoise is my favourite DAW. It's a pimped out old school tracker that combines everything that I need. I just can't live without it. Up until recently I've made all my music with Renoise. Great daw though it's had to work with large audio files (vocal stems mainly). Still I recommend it. Best DAW ive used so far. I bought it, thats how much i love Renoise. does what you want it to do, always. the main thing about renoise is that it is dependant on you, and your creativity. this daw will do exactly what you want it to do, no exceptions. The last tracker I used before abandoning vertical writing. Former Chill Member dBlue is on the development team for Renoise. It is by far the best tracker on the market, and it's the only tracker based DAW. We endorse this DAW! If you like the tracker interface, this is the DAW for you. Full VST support, external midi, all the stuff you need. Great sample/instrument-editor can sample a full VST-instrument with one button. Instrument editor/Sampler also available as VST plugin if you use other DAWS, worth a check: Redux.